Follow our step-by-step customization tools, and create a custom Little Pal. These bookplates are perfect for keeping tabs on your special books. Your littlest book lover will thank you! • Each bookplate measures 2.3" X 3.4". 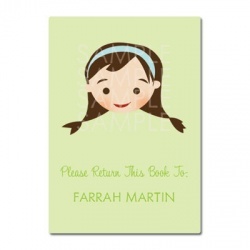 • Bookplates are professionally printed out-of-house and are customized with the name of your choice! • Set of 30 adhesive-backed bookplates with rounded corners..
• Bookplates come packaged in our signature tin box. Great for gift giving! • Think of your favorite bibliophile: children, adults, librarians, teachers, bookclub folk! SPECIAL NOTE! We've done our research and found a printing company that offers label stock that is not only premium quality, but also child safe! You can feel confident that our product is lead free and phthalate free! Please type your name EXACTLY as you'd like it to appear. Please enter your information carefully as we cannot be held responsible for any typos and/or misspellings. Bookplate Text Please Return This Book To: This Belongs To: This Book Belongs To: From the Library of: No text, thanks! Happy Holidays Rubber Stamp: "Vintage Santa"